Three years after a complaint was first filed, Nong Plalai officials demolished a private structure encroaching on public land. 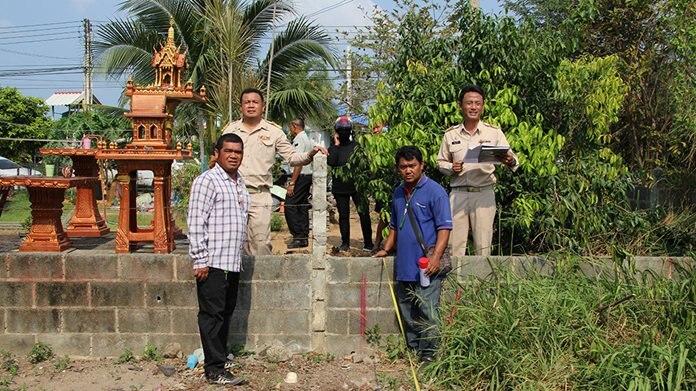 Three years after a complaint was first filed, Nong Plalai officials took measurements to confirm the documents and then began dismantling the illegal structure. Mayor Pinyo Homklan led staff to a residential street in Moo 4 village May 2 where Chatsi Sommart had complained in 2014 that her neighbor had built on public land between their two homes, blocking off an entrance to her property. Three years ago, she had provided the sub-district with title deed documents showing she was supposed to have two entrances to her property: one on the road in front and the other on the side abutting public land. That entrance no longer existed because her neighbor usurped the property. Staff took measurements to confirm the documents and then began dismantling the illegal structure. The case will now be forwarded to the courts for prosecution against the neighbor.